This church will be a familiar sight to many travellers, as it sits above the busy Copdock Mill interchange between the A12 and A14. Despite this, its pretty churchyard is a peaceful place, mainly because the A12 lies in such a deep cutting. A little bridge over it will take you to the remote church of St Mary, Belstead, after about half a mile. In the other direction is the even more remote church of St Mary, Washbrook. So it seems that urban planning can sometimes be sympathetic. 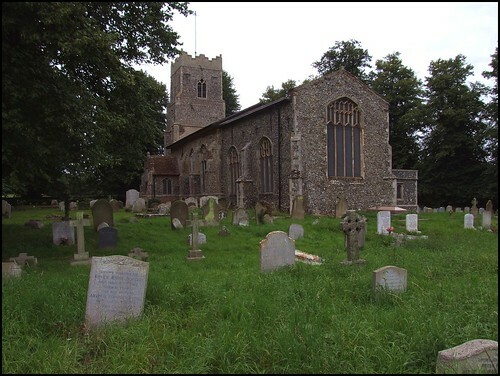 St Peter is a fairly large, neat building, a testimony to the severe 15th century Perpendicular which first created it, and its almost complete refurbishment in late Victorian times, one of the last in Suffolk of the century. In fact, the most obvious parts of this restoration, the nave roof and gallery, were installed as late as 1901, to celebrate the glorious Golden Jubilee of Queen Victoria three years earlier. Her death shortly before their dedication must have put a bit of a dampener on things. I have to tell you that St Peter is one of the very, very few churches in the Ipswich area which is kept locked without a keyholder. There can be no reason for this - it sits in its village, unlike many of its neighbours which are accessible to pilgrims and strangers. But there is no room at the inn here, I am afraid. Ten years ago, the churchwarden of the time cheerfully showed me around the inside, but that was in the days before digital cameras, of course - or, at least, in the days before I owned one. I remember it as being almost entirely of its 19th century restoration, apart from some 16th century panels reset onto the gallery - they probably came from a big house originally. The most remarkable thing about the interior is that the original 15th century roof of the north transept survives. I recall thinking it odd to see such work on a small scale. But all I could do today was to wander around and contemplate the sheer misery of the broken Christ on the Calvary to the east of the chancel.